A poignant reminder of fallen heroes, wear the Samurai Army Rugby Union Lest We Forget Poppy Kids Remembrance Day Rugby T-Shirt with pride and honour. Made from polyester, the Performex System fabric has been developed exclusively for Samurai and allows air to circulate around the body to keep you feeling cooler for longer. 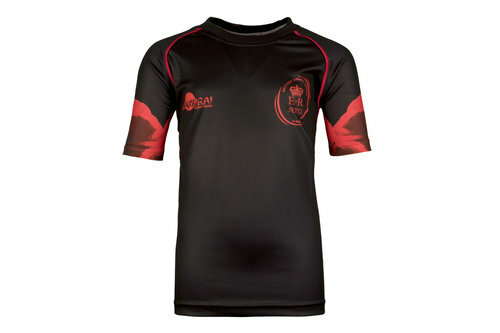 The elegantly simply design features sublimated graphics in the form of poppies on the sleeves in red, creating a standout look upon the black base colour. On the rear the words 'Lest We Forget for those brave gave their lives so we could live ours’ appears on the rear.